The business supporting the top lithium stock is showing no signs of slowing down. Will Wall Street stop punishing the stock? If second-quarter 2018 earnings results don't change Wall Street's mind, then perhaps nothing will. Either way, investors who have become stressed out over Albemarle's (NYSE:ALB) more-than-20% price drop since the beginning of the year should find comfort in the company's strong operational performance to date. In the most recent quarter, the lithium producer delivered double-digit year-over-year growth for revenue, adjusted EBITDA, and adjusted diluted earnings per share (EPS) -- prompting management to raise full-year 2018 guidance for all three metrics. And while the lithium segment once again carried the business, the company's other two business segments delivered double-digit adjusted EBITDA growth in the most recent quarter. Here's what investors need to know. There were relatively few blemishes during the first half of 2018 as far as operations were concerned. Most noteworthy negative factors were offset by positive trends elsewhere. For instance, the lithium segment adjusted EBITDA margin was slightly lower in the most recent quarter compared with the year-ago period (45% vs. 47%), but volume growth more than made up for minor headwind. The bromine segment faced higher input costs from higher crude oil prices, but raising selling prices more than made up the difference. The catalysts segment overcame a force majeure from certain supply shortages with 16% higher sales volume. The year-over-year comparison for operating profit and net income is muddied a bit by the sale of the polyolefin catalysts business in early April 2018, which provided an after-tax gain of $177 million. Nonetheless, even subtracting that amount from each profit metric results in a healthy year-over-year gain. That's thanks to a solid all-around performance from all three business segments, which gained momentum in the second quarter. As management explained on Albemarle's second-quarter 2018 earnings conference call, the momentum for all three segments is expected to continue in the second half of 2018. That's exactly why management decided to raise full-year 2018 guidance for revenue, adjusted EBITDA, and adjusted diluted EPS. It may also be enough for investors to take a hard look at Albemarle stock, which, as explained below, appears cheap relative to peers. In reality, management only made subtle changes to full-year 2018 guidance. At the midpoints, Albemarle is now expected to deliver $3.4 billion in revenue for the year, along with adjusted EBITDA of about $1 billion and adjusted diluted EPS in the neighborhood of $5.40. Each represents a roughly 3% increase from the previous guidance. However, compared with pro forma results (excluding contributions from divested assets) achieved in 2017, the updated guidance would deliver 13% growth in revenue, a 17% leap in adjusted EBITDA, and a 22% jump in adjusted diluted EPS. That would make for a solid year of progress. But it won't all come from operations. Albemarle announced a new $250 million share repurchase program that it expects to complete by the end of 2018. That would reduce the outstanding share count by roughly 2%, therefore lifting the dividend yield and providing a minor boost to EPS. That said, while the business is humming along, there may be better uses of the cash than buying back shares -- for instance, paying down the $1.6 billion in outstanding debt. Management's argument against that use of cash is pretty straightforward: At the end of June, Albemarle sported a net debt-to-adjusted EBITDA ratio of 0.8 times, and the year-end value (after accounting for the share repurchase program) is expected to settle around 1.2 times. Both are well below the long-term target range of 2 times to 2.5 times, so fire away at repurchasing shares, management says. While the company can certainly afford to do so and shares are relatively cheap after the 20% year-to-date drop, share buybacks, despite being all the rage these days, simply don't rank very highly in terms of creating real-world value. With plenty of cash supporting its current valuation, the lowest EV-to-EBITDA ratio, and plans to dominate the present and future of the global lithium industry with new production expansion projects, Albemarle still appears to be the top lithium stock on the market. 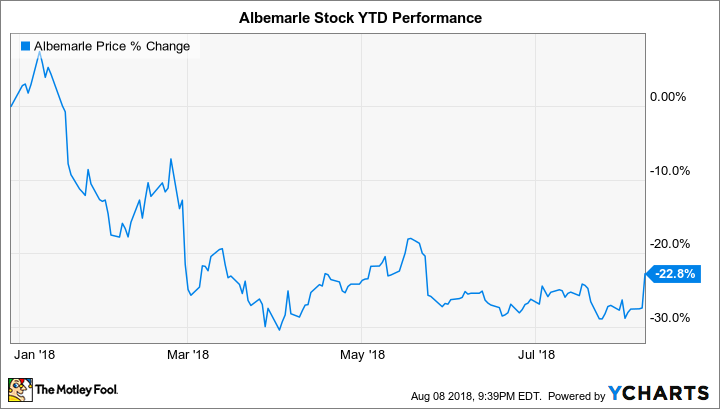 Despite a falling stock price, the narrative really hasn't changed for Albemarle in 2018. The company continues to exploit nearly insatiable global demand for lithium, while investments in its two other (mostly forgotten) business segments continue to pay off for shareholders. If the business can deliver on its updated full-year 2018 guidance and new lithium production projects enter service by the end of the year as planned, then shareholders should be able to count on this stock to deliver growth in both the short and long term. Who Are Tesla's Lithium Suppliers? Albemarle vs. SQM vs. Livent: Which Had the Best Lithium Results in Q4?